Have you ever prayed and prayed for something, and felt like the heavens were brass – like your prayers were just bouncing off of the ceiling? Have you ever felt like you just had no hope about a situation? Well, we can find encouragement in God’s word that when it seems like all hope is gone, God comes through in a great, unexpected way! Let’s look at the story of the widow of Nain in Luke 7:11-17. In Jewish culture in Jesus’ time, when a woman was widowed, the responsibility of caring for her financially fell upon her son or other male relatives. Now this widow’s only son had died, also, which meant not only more grief in her life, but all provision for her needs was dried up! She might have to go live with distant family members, or worse yet, become a beggar on the street! She had no husband, no son, and no hope! I’m sure this woman was in great pain, and felt totally alone. Her husband had died, and now her only son. There can’t be anything more difficult than your spouse or child dying. Here this woman was, devastated with grief, and now facing a very uncertain future. How would she pay for her home, her food, her clothing? What was she going to do? Fear stared her in the face, mocking her. She probably felt no hope, just as we sometimes feel when we are praying about things and nothing seems to be happening. But just hang on a minute. There’s breakthrough coming – Jesus is on the way! Jesus had great compassion on this woman, just as He does on us. He sees our tears, our pain, our sorrow, our hopelessness. Psalm 56:8 says, “You number my wanderings, put my tears into your bottle. Are they not in your book?” What a beautiful picture – God putting our tears into a bottle. Tear bottles were common in Roman times around the time of Christ, when mourners would fill small glass bottles with tears and put them in burial tombs as a sign of respect. Sometimes women were even paid to cry into these bottles during the mourning procession. The more tears produced, the more important and valued the person was thought to be. 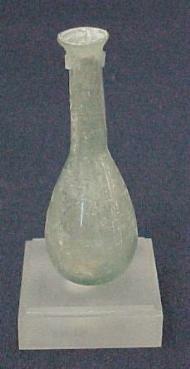 During the Victorian period, tear bottles were made with special stoppers that allowed the tears to evaporate. Loved ones would put their tears into the bottle, and when the tears evaporated, the mourning period ended. During the American Civil war, women would cry into tear bottles, and save them until their husbands returned from war. Their tears showed the men how much they were loved and missed. Jesus didn’t want this woman to have to wait until heaven to be comforted. He had compassion on her – He wanted to give her hope right now! So He raised her son from the dead. Can you imagine the joy she must have felt? The Bible says that fear fell on everyone there, and they glorified God. God had visited His people. Just as with the widow of Nain, God wants to do great, unexpected things in your life and mine. He wants to visit us His people right now, showering us with His love and compassion! When you’ve lost all hope, and you feel like God does not hear your prayers, just know that Jesus is on the way to do a miracle for you! Yes, Lois, God is just amazing! He has collected all our tears in a bottle. He cares about every detail of our lives, and loves us SO much! Thanks for your comment! It is comforting to know that God does miracles and that he cares about us. No matter how many tears we cry, God is there with his love and compassion.